It’s the end of an emotional and exhausting week for participants of the Aboriginal Employment Strategy’s (AES) iTRADIES program in Western Sydney. After six consecutive days of TAFE, followed by a nightly program of life coaching activities, the participants have just experienced one of the most challenging and impactful weeks of their lives. As their final night together draws to a close, several young men from the program perform an Aboriginal dance in front of the rest of group and their families. The dance has been taught to them by one of the elder members of the program. None of them have ever done anything like it before. Afterwards, one of the young dancers steps forward and asks permission to speak. Taking hold of the microphone, he tells the room how ashamed he always felt to be Aboriginal, how he’d come to hate himself because of the racism he’d experienced at school. But now, after the events of the week, and having danced with the other young men, he tells the room how proud he feels to be Aboriginal, and how proud he feels to be himself for the first time he can remember. When you talk to iTRADIES Program Coordinator and AES National Construction Manager, Rohan Tobler, he’ll tell you that’s it these types of moments that reveal just how unique the I-Tradies program is, and most significantly, why its achieving 90% completion and retention rates and putting Aboriginal people into jobs and keeping them there. “You can imagine a young person taking that mentality into the workplace, being proud, being focused on a career goal, all because they know who they are for the first time ever,” says Rohan, who speaks with ample enthusiasm for the work, particularly when he reflects on the personal stories and growth of participants. Rohan’s concept for the I-Tradies was inspired in part by an earlier initiative (Koori Job Ready) which he helped coordinate with his father, Les Tobler. training and support for Indigenous people who faced specific challenges in gaining lasting employment, with a particular focus on Indigenous youth. 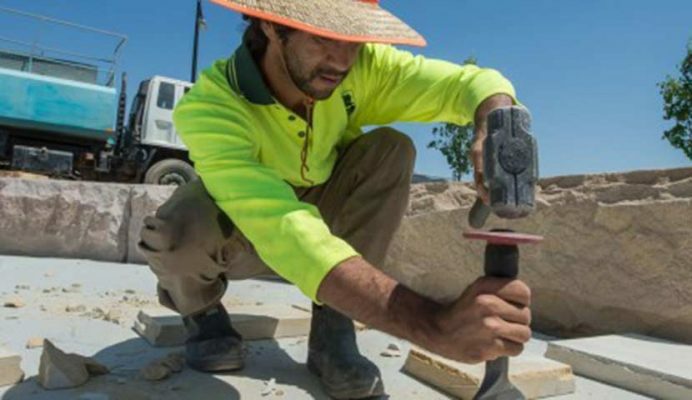 “I knew the program had to be more than just hammer swinging, I wanted to make it intense and mirror some of the leadership courses I’d done, having the participants stay with us overnight for six days doing TAFE followed by leadership and life skills training at night,” explains Rohan. Over six days iTRADIES participants complete eight modules in a Certificate 1 in Construction. 20 to 25 participants spend the entire duration of the program together, sleeping under the same roof, waking up at the same time, travelling to and from TAFE, and taking part in nightly yarning circles and life coaching activities. The program adopts a broad approach, starting with the basics like eating a healthy breakfast and discussing motivations for getting out of bed on a cold morning to get to work. The program also has a range of corporate supporters and industry partners who speak to the group about employment opportunities and what employees are looking for. It’s a ground-up strategy aimed at equipping participants with the all-round skills, motivation and confidence that will allow them to transition into lasting employment. “In the yarning circles we look at interview skills, we have people come in from State Debt Recovery, Centre Link, Roads and Maritime, who talk about how to get a licence, or how to pay your fines,” explains Rohan. “I talk about my life too, my struggles, times where I’ve had to pick myself up again, I do this to provide an example of how you can change and where change can lead to. Rohan says that while the busy week can be exhausting, the challenging aspects are crucial to the benefits participants take away from the program, and only a very few have opted to leave before completing the course. Since beginning in 2015, the iTRADIES program currently boast a 95% participant completion rate with participant employment retention at 85% at 6 months, well above the national average in the Indigenous space. Importantly, participants have real construction based job opportunities available to them at the completion of the course, which includes roles in plumbing, carpentry, administration, landscaping and traffic control. Several participants are now working in a range of roles across the construction sector, including two young women who were among the most recent group to complete the program. iTRADIES graduates have been placed with companies such as LendLease, Empower Construction, Ultra Flow Plumbing, Georgia Constructions and Hansen Yuncken. 46 year-old Mark Pittman was among the first group of iTRADIES participants and says the experience provided him with the direction and confidence to get back into regular work and stick with it. After completing the program, Mark has been working in a range of cleaning roles on construction sites and says the impact on his self-esteem and family life has been huge. “I was the oldest fella in the group, the boys looked up to me and called me Uncle, and that made me feel honoured, when they had some problems I was talking to them about their problems, sort of guiding them in the right direction,” says Mark. Having been a traditional Aboriginal dancer for nearly 30 years, Mark was also the catalyst for that powerful display of culture and pride that took place at the end of the first course. He says he was proud and deeply moved to witness the transformation that occurred among members of the group. Due to its success in the Western Sydney, the AES are now looking to deliver multiple iTRADIES programs across the greater Sydney region. There are also plans to deliver programs in Tamworth and Kempsey. The interest in the program from a growing list of developers and corporate partners has Rohan encouraged about the potential for future growth of the course and for the benefits it can deliver for individuals and community. “Every course we do I leave a piece of me with it because it’s basically modelled on my life and my father’s life, it’s rewarding because I see people actually changing, when I see one kid do it, I want to see another one do it, and another one, and not just to get employment but to change themselves further,” says Rohan.